The galgo has a slender and agile body designed to perfection to run at speeds of up to 65 kilometers an hour (40 miles an hour). Running is their passion and they like to run at full speed during short periods of time. They then need to rest and recover in a soft bed or the owners favourite sofa. 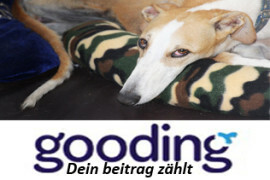 Galgos can sleep up to 18 hours a day, but in between they will need to run 2 or 3 times. As a rule they are sociable dogs that enjoy human and dog company. They love to sleep together very close, so if you have more dogs, get some large beds where it will be able to nestle against the other dogs. Some galgos like children, but many dread them because they have been badly treated by them. So, if you have children and have thought of adopting a galgo, please ask how the galgo you are interested in adopting behaves with children. Most galgos are terrified of men and even a mans voice can make them run away. This is due to the high rate of men that mistreat animals in Spain. With cats, galgos react in many different ways: some are scared of them and run away, others show interest but don’t do anything, a few adore cats and would even defend them if another cat or dog got close and the rest have a very strong hunting instinct and would hunt a cat down. Galgos learn most things if taught with affection. They can be stubborn, but this is not an obstacle to learning, you must only be patient. The first thing you must teach your galgo is to come when called. The first times you take your galgo for a walk take it on a lead, a harness and a martingale collar or in a safely fenced in area with a fence of more than 2.5 meters high. 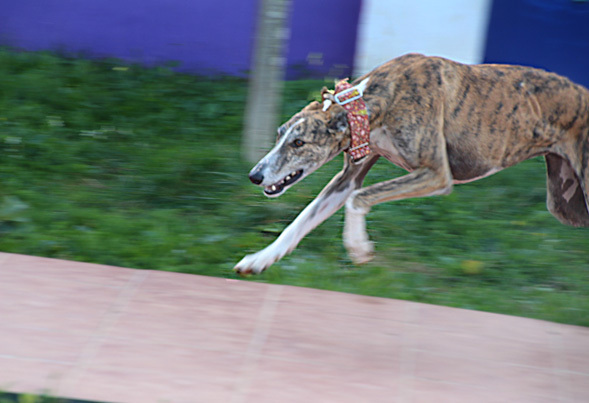 Once the galgo and you have got to know each other and your galgo listens to your call, you will be able to let it loose and you will both be able to enjoy: the galgo running and you watching it!